At the close of the last century George Johnson, Pete Adolphson, and I decided to form the Australian Shepherd Health and Genetics Institute (ASHGI). What we envisioned as an informational/educational effort has become so much more thanks to our faithful volunteers and the international support of the breed community. In the late 1990s most of the breed was centered in the US and Canada with small but growing populations in Europe and elsewhere. Breed politics in the US were rocky, with two competing national breed clubs which had different and sometimes incompatible agendas which. Politics held a higher priority than health issues. George, Pete, and I were all interested in the genetic health of the breed, but we realized that in the climate of that time it would be difficult for any existing entity to establish a health program that would be accepted by and accessible to the breed as a whole. George, a botanist by training a botanist, had developed an interest in canine genetics when he got into Aussies, Pete was a geneticist, and I had been doing health and genetics education in the breed since the mid-1980s. We started kicking around the idea of forming an independent, not-for-profit corporation that could focus on the health of the entire breed without being subject to political wrangles or competing priorities; a group that would work cooperatively with clubs and registries when possible but could carry on its work independently, as well. We incorporated ASHGI in the state of California in 2001 and applied for federal charity status with the US Internal Revenue Service, which was granted in April of the following year. Those first months were spent defining the organization’s structure and goals and solidifying its legal status. In July of 2002 the board introduced ASHGI to the breed community. ASHGI’s reason for being has always been the health of the Australian Shepherd breed. Our programs and activities are focused on providing the best possible information, education, and resources to Aussie breeders and owners no matter who they are, what country they live in, what registry(ies) their dogs are listed with, what canine activities they participate in, or what clubs they have joined. ASHGI considers the breed world-wide to be a single entity. For us it is about the dogs, not competitive events or politics. In the years since ASHGI’s formation we have established ties with research institutions, research funding agencies, and all-breed health registries, as well as regional and national Aussie clubs. Our first major effort was establishing the website, www.ashgi.org. 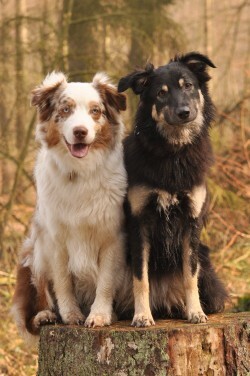 Ever since, the site has served as a conduit to the breed community as well as people who have Aussies but may not be active in breed organizations or events. Throughout our first decade we developed effective fundraising programs to support research; our first grant sponsorship was made in 2005 for the epilepsy study at the University of Minnesota. We have provided logistical support to researchers studying epilepsy, cancer, and cataracts, and also conducted two important health surveys starting with a cancer survey (2006-7) followed by a broad review of breed health (2010). During this period we also initiated planning for the International Directory for Australian Shepherd Health (IDASH). ASHGI has always recognized the need for teaming with like-minded organizations for the benefit of the breed. Since inception ASHGI has worked in cooperation with researchers, breed clubs, other health-focused organizations, and granting agencies which fund canine health research. Through these partnerships and alliances ASHGI brings Aussie health issues to the attention of those who may provide the breed community with better tools for prevention and treatment. We network not only within the breed but with all-breed and other breed organizations to forward the goal of improved purebred health. Clubs are the mainstay of every breed. Whenever possible we partner with national breed clubs, working with their appointed breed health officials. We are able to share information and ideas and help each other with development of our respective programs. While Aussies have been in the US and Canada for a long time the breed’s presence in other parts of the world is very recent. The first significant exports, to Europe, took place in the 1980s. Today Aussies can be found on every continent except Antarctica. The relatively short history of the breed outside North America and the continuing and frequent exports from here to the rest of the world has made the type and frequency of health issues similar wherever the breed is found. Because of this ASHGI makes every effort open its programs to Aussie breeders and owners wherever they may be. We have supported research in other countries, presented educational seminars in Canada and eight European nations, and our website offers material translated into eleven languages. Our International Directory of Australian Shepherd Health (IDASH) Open Health Database includes health screening data and DNA test results provided by several European kennel clubs and we have plans to incorporate data from additional sources as they become available. ASHGI recognizes the importance of communication. Our website is a major health resource for Aussie owners and breeders. In a Google search on “Australian Shepherd health” done on February 12, 2019 ASHGI appeared on the drop-down options below the search string box. Our site offers numerous articles on canine health and genetics topics as well as a selection of lay language articles that explain how to apply the tools genetic science has provided to everyday breeding practice. In addition it features various ASHGI programs and provides a platform for IDASH. Our site has generated interest from people and organizations serving other breeds here and abroad, with frequent link permission and reprint requests for club and canine-focused newsletters and magazines. We place regular ads in the Aussie Times and Australian Shepherd Journal to inform people of events and ASHGI programs, raise awareness of health issues and good breeding practices, and to encourage financial support. We run ads in ASCA’s Auss-E News, post them on our Facebook page, and distribute via our e-mail list. ASHGI established its Facebook page in 2010. It currently has over 6500 followers and provides a simple no-cost method of reaching people interested in ASHGI programs and services as well as a quick and easy way to distribute time-sensitive information. Facebook also allows followers to comment on posts or ask questions privately via Facebook messaging. Communication needs to be a two-way street. When people are dealing with a sick dog they want a response, not a canned message or link to a website. For this purpose we created our Ask-the-Experts program. By clicking on the question mark logo which, appears in multiple places on the site, people can send an e-mail to a volunteer who will answer their questions. We launched a new communication conduit in June 2015. ASHGI Lifeline, our quarterly e-newsletter offers updates on ASHGI activities and accomplishments. Subscription is free. Nothing beats face-to-face contact for communicating a message, receiving feedback, answering questions, or simply the pleasure of meeting our supporters in person. The nature of our small, internationally-focused organization doesn’t always allow this but every year since 2004 ASHGI has had a booth at the largest breed event anywhere, the ASCA National Specialty. Depending on event location and volunteer availability, ASHGI offers health information, and research sample collection. We also use the opportunity to raise funds for health research. One of ASHGI’s primary purposes is to educate breeders and owners about canine genetics, its application to breeding practice, and to the hereditary diseases and traits of the Australian Shepherd. Our website includes 200+ pages of articles on health topics, genetics, and breeding. ASHGI also offers educational presentations for clubs or other interested groups. We have several prepared programs designed for one- or two-day events and are open to developing programs for a host’s specific needs and interests. We do not restrict our events to the US and Canada. Having presented programs in several European countries. Knowing the frequency of health issues in the breed population and their impact on individual dogs is important to setting health priorities. While statistics are readily available on those things subject to reporting to the OFA or European kennel clubs’ registries, these typically cover a limited range of diseases. To gain deeper knowledge, every breed should periodically have a health survey. ASHGI has thus far conducted four breed health surveys for Aussies: The Australian Shepherd Cancer Survey (2007),the Comprehensive Breed Health Survey (2009-10), the Australian Shepherd Longevity Survey (2017) and, with the Animal Health Trust, an Australiann Shepherd Cataract Survey (2018). Reports and summary data are available on our website. These surveys have provided us with valuable data which we use to assess health trends and identify specific areas of concern. Data is important not only for us, but for the community as a whole. Toward that end we created IDASH. Initially the program absorbed the pedigree analysis service I had been operating for many years, with the long-term goals of computerizing and web-mounts that service as well as offering. To this we have added the on-line pedigree database originally developed by Patrick MacRoberts, offering various pedigree reports drawing on a database that currently numbers in excess of 100 thousand dogs dating from the early years of the breed to the present. We augmented the MacRoberts’ original offerings with a report in which the dog’s names are linked to their health records in our Open Health Database. In addition to pedigree data, we have extensive data on health issues, dental faults, and disqualifying colors. We have significant amounts of data downloaded from OFA or obtained from the Swedish and Finnish Kennel Clubs, and DNA test results from the Kennel Club (England), French hip, elbow and epilepsy data, as well as a growing amount of owner-submitted data. Anything we acquire that is public access or for which we have owner permission appears in the OHD. Other data remains confidential but is used for research and pedigree analysis purposes. All IDASH services can be accessed through the portal on our website, with modest fees for pedigree analysis and pedigree database subscription which help support our operations and contributions to research. Since 2003 ASHGI has actively supported research on breed health issues through promotion, logistical assistance and, as of this writing, over $230,000 in financial support. ASHI is too small an organization to fully fund research projects so we work with larger organizations like Morris Animal Foundation and the AKC Canine Health Foundataion which have the capability to offer significant grants as well as the staff and expertise necessary to evaluate the quality of grand applications and assure compliance with the grant agreement. We have been proud to sponsor MAF and CHF grants supporting research on cancer, epilepsy, cataracts, Border Collie Collapse, and the International Partnership for Dogs’ Harmonization of Genetic Testing program. We also have supported epilepsy grants through Toby’s Foundation. Whenever mutually desirable, ASHGI provides logistical assistance to research. We collect samples at our annual blood draw clinic and created a webpage which highlights current Aussie health research and provides study contact information. Efforts benefited by this include epilepsy and Border Collie Collapse research at the University of Minnesota, and cataract research at the Animal Health Trust. We have also actively supported the Orthopedic Foundation For Animals’ Canine Health Information Center (CHIC) DNA Repository. Scientific conferences provide superb networking opportunities with researchers as well as ASHGI’s peer organizations from other breeds. ASHGI is regularly represented at CHF’s biannual conference. The author has three times had the privilege of attending the International Canine/Feline Genomics Conference, a biannual international presentation of cutting-edge research held in the US every four years. ASHGI doesn’t just offer information and send money off to research. We do our own part for breed health. One of the most public and to-the-point is our annual research and CHIC sample collection at the ASCA National Specialty. One of the greatest impediments to progress on canine genetic health research is a lack of samples. The annual blood draw at ASCA’s national specialty gives us the opportunity to collect research and CHIC samples at low-to-no cost to the dogs’ owners. No matter how much research is done or information available, if the breed community is not health-focused it will make no difference for our dogs. ASHGI is deeply committed to encouraging the highest standards of breeder ethics as related to health. Toward this end, in 2004 ASHGI adopted the grassroots-created “Ten Steps to a Healthier Australian Shepherd” created by members of the AussieGenes discussion list. The steps are designed to be applicable to any Aussie breeder, anywhere and are flexible enough to be adapted to local rules and laws. The program has drawn interest not only within the breed, but from people in other breeds and even other species. An international group of over 200 people and two club have signed on as of this writing. ASHGI’s compiled its Recommended Testing and Screening Protocol in connection with 10-Steps as a guide to proactive and effective health screening. ASHGI is an all-volunteer organization, from the people who work a single shift at an event on up to members of the board. ASHGI has a hard-working group of core volunteers who see to the organization’s ongoing activities and are vital to ASHGI’s accomplishments. We are always seeking dedicated volunteers who are enthusiastic about improving breed health. If you have expertise you think could be helpful to our operation or programs or you are willing to be on an on-call list for short-term needs like booth help at Nationals, please let us know. The best and most dedicated group of volunteers can’t accomplish much without funding. While we like to get things done for free, the reality is it takes money to accomplish anything important. We streamline our operations and seek in-kind donations to minimize expense wherever possible. Individual donations made without restriction and the income from IDASH pedigree analysis and pedigree services cover the organization’s basic operating costs and program support. But research support, our largest expense, also requires donations from those who care about the breed. Early on we did a few small fundraisers including a silent auction and small raffles at ASCA nationals. The raffles became a major fundraiser between 2007 and 2012, cumulatively raising $85000 for epilepsy and cancer research. Unfortunately we had to abandon that fundraising model when we discovered that we could not legally qualify to conduct charity raffles in any state but California, where we are incorporated. We are deeply grateful for the fundraisers organized by clubs and individuals to benefit ASHGI. As a small token of our thanks, we list our donors on our website and in our Lifeline e-newsletter. All direct donors receive an ASHGI logo sticker with a personal thank-you suitable for tax purposes. Many of our donations come in the form of memorial gifts, frequently honoring a beloved dog. Whenever we receive these or gifts given inhonor of the living, we send a card to honoree or the family of the deceased. We have also created the ASHGI Life Record booklet as a donor premium. First distributed in 2015, the Life Record is a small-format, easy-to-pack booklet that has space to record identification, health and emergency contact information for your dog as well as photos and other noteworthy information. The ASHGI Life Record is sent upon request to any US or Canadian donor of $50 or more (unfortunately shipping expense is too great for us to offer it elsewhere). The piece makes an excellent addition to a puppy packet, so in 2016 we created “Litter Donation” rates which allow the breeder-donor to receive multiple copies. We at ASHGI are proud of all we’ve accomplished for our beloved Aussies over the years. We will continue to develop and adapt programs that provide information and education for aussies owners as well as tools for breeders to help them make informed and health-proactive breeding decisions. Supporting the best possible health research for common Aussie health issues will remain an important goal. The continued on-going support of the world-wide Australian Shepherd community will keep us doing all of this and more for many years to come and we thank you all.